It Should say December 12th! H5JM In Maribo, Denmark. 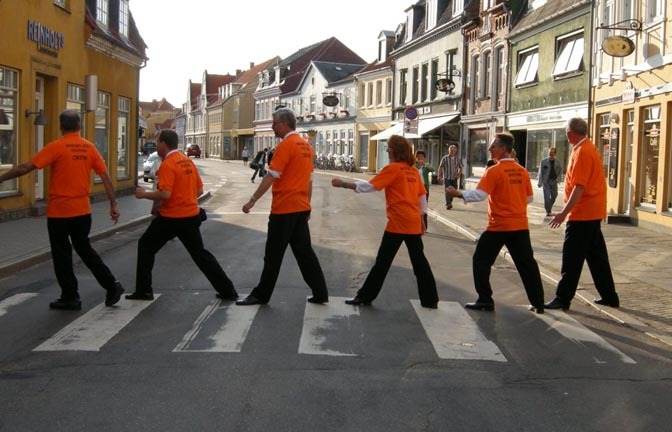 July 2009 - definitely not Abbey Rd! The Cathedral, Maribo, Denmark. We parade. 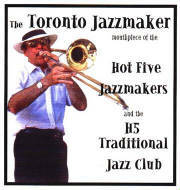 The Hot Five Jazzmakers are a versatile Canadian jazz group and play a mix of ragtime, blues, spirituals & classic jazz with the flavour of the 1920’s/30’s – the golden era of jazz. Don't be confused by the word "FIVE" however. Mostly they field six players and often seven when the occasion demands. 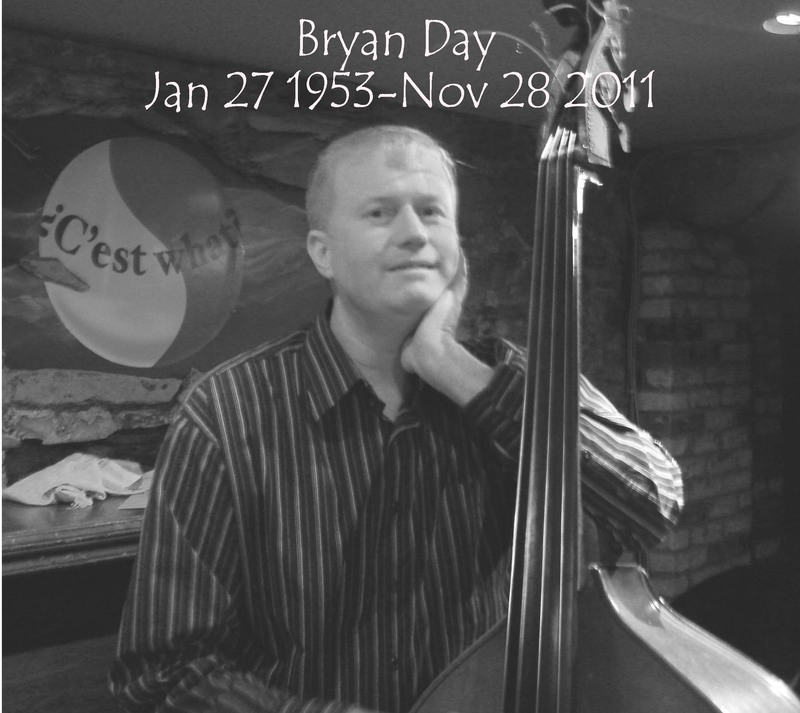 Their bi-weekly Saturday matinee sessions in the intimate setting of “C’est what?” (67 Front St E, Toronto) have been a feature of the Canadian jazz scene for many years. 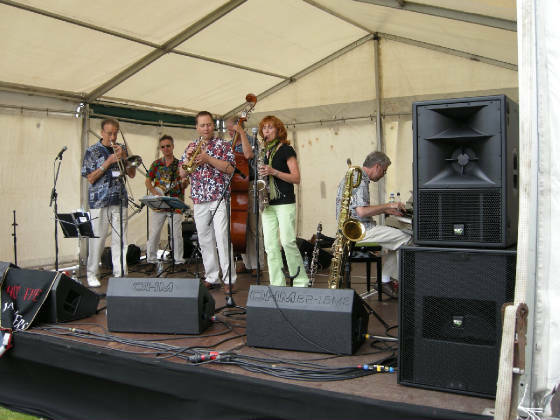 In the summer of 2009, they enjoyed a successful European tour, appearing in England at the Whitley Bay International Jazz Festival and the Maribo Jazz festival in Denmark. 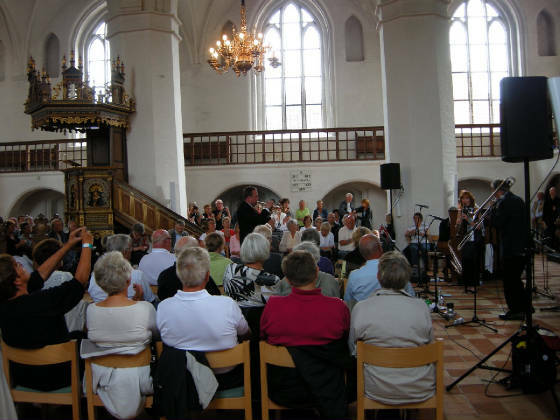 In June 2011 they appear at the Kirkcudbright festival in Scotland and the Silkeborg Riverboat Jazz Festival in Denmark. 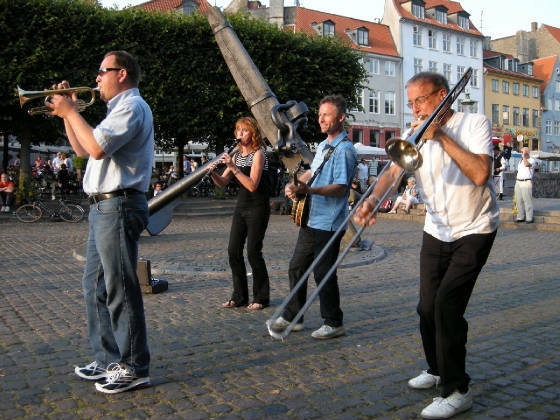 Previous years have seen many appearances in New Orleans and include two tours of Northern Germany. They have also represented Canada at the Marciac festival in France and the Edinburgh international Jazz Festival in Scotland. Their festival appearances in North America are too numerous to relate here. 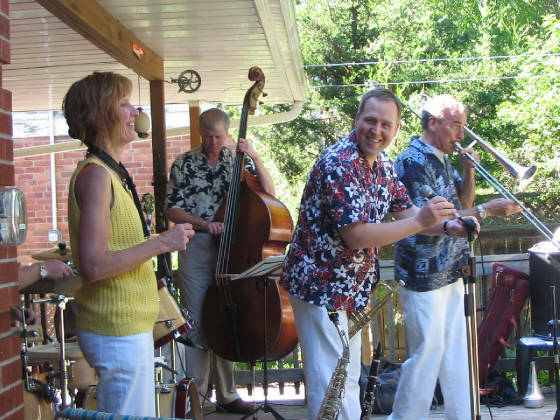 There have been a couple of Caribbean jazz cruises and many summer jazz lake cruises on the paddleboat "Trillium" starting from Toronto harbour. They have issued numerous CD's, details of which can be seen elsewhere, with audio extracts to which you can listen. Plays traditional tailgate trombone in New Orleans style. Left England in 1969 and now retired.... but busier than ever! Reed player who doubles on clarinet, alto & baritone saxes, plus occasional piano & banjo. Also a vocalist. Recently retired from a career in the pharmaceutical industry. 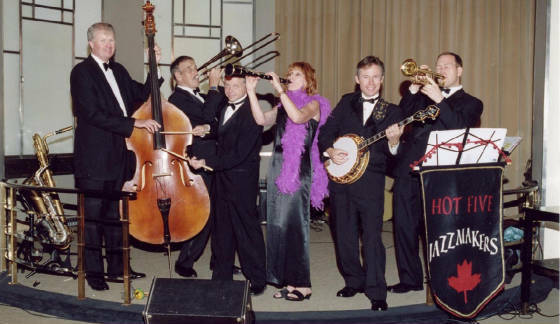 Jamie was voted “All-Canada Banjo Champ” twice in the 1980’s. Jamie also loves to sing but mostly does this in "Barber Shop" style, Doubles on acoustic guitar for some tunes. Brings youthful energy and a carefree approach to the group. 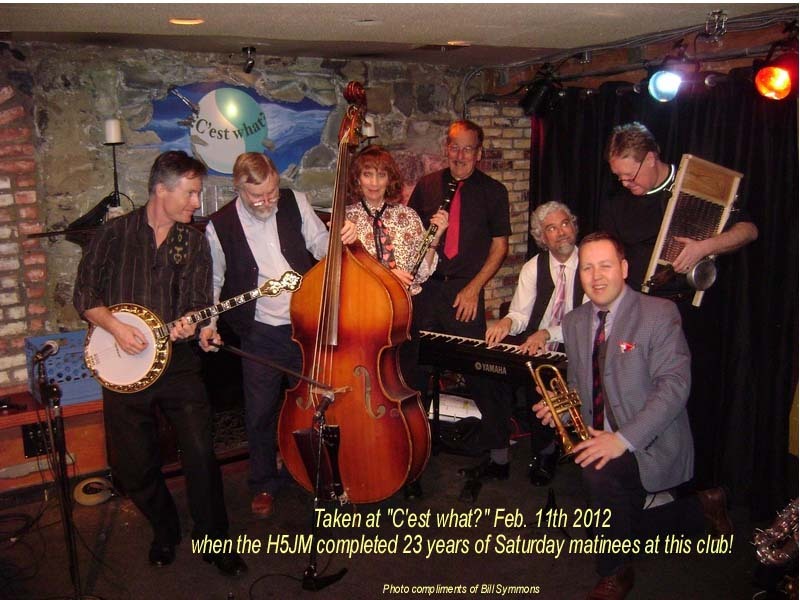 Andrej came to us from Slovakia in 2002, where he was the oldest member of a Dixieland band. The Regular keyboard player at our "C'est what?" Saturday matinees. Colin Bray & Abbey Sholzberg - String bass. Somehow or other we have ended up with two bass players! 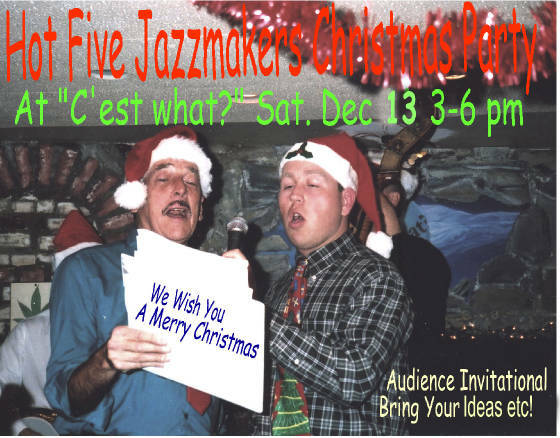 They alternate at our bi-weekly "c'est what?" matinees. 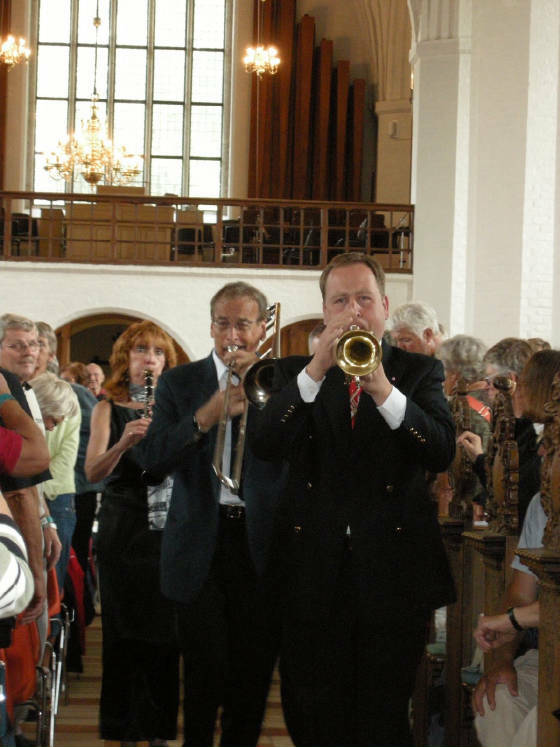 The band plays discreetly with the Harcourt Church Choir. "We Shall Walk through The Streets of The City"
Band's Photo Gallery, click here.